A Campaign for Kindness. Higher Order Thinking (HOT) Schools Newsletter. April 1, 2017. Ken Dixon: A Civics Lesson for the Grown-Ups. CT Post. January 15, 2017. Connecticut Kid Governor Sworn Into Office. CBS New York. January 14, 2017. CT’s Kid Governor 2017. Hartford Courant. January 13, 2017. Connecticut’s New “Kid Governor” Sworn In. WTNH 8. January 13, 2017. 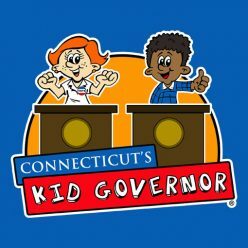 Connecticut Using “Kid Governor” to Get Children Interested in Politics. CT Boom. November 16, 2016. Kid Governor Reflects on First Term. WFSB 3. November 11, 2016. Kid Governor Rocks! Rena Tobey’s Blog. August 17, 2016. Connecticut’s Kid Governor Visits Meriden Public Library. Record-Journal. August 17, 2016. Kid Governor to Visit Middletown Library. The Middletown Press. August 11, 2016. Mayor LeClerc to Present Check to Old State House. The Hartford Guardian. May 25, 2016. CT Kid Governor to Get Office at the Old State House Funded by East Hartford Mayor. Hartford Courant. May 25, 2016. CT’s First Kid Governor Promotes Kindness. CT Association of Schools. May 10, 2016. Warren Students Visit Old State House. The Greater New Milford Spectrum. April 14, 2016. Inquiry Dimension 4: Effectively Presenting Findings and Taking Informed Action (webinar). CT Department of Education/CT Core. March 29, 2016. Young Celebrity. Journal Inquirer. March 20, 2016. Governor Meets with State’s ‘Kid Governor’ to Discuss Kindness and Learning. FOX 61. March 18, 2016. Conn. “Kid Governor” Gets Special School Visit from Malloy. News 8 WTNH. March 18, 2016. Connecticut’s “Kid Governor” Meets Gov. Malloy. WFSB 3. March 18, 2016. 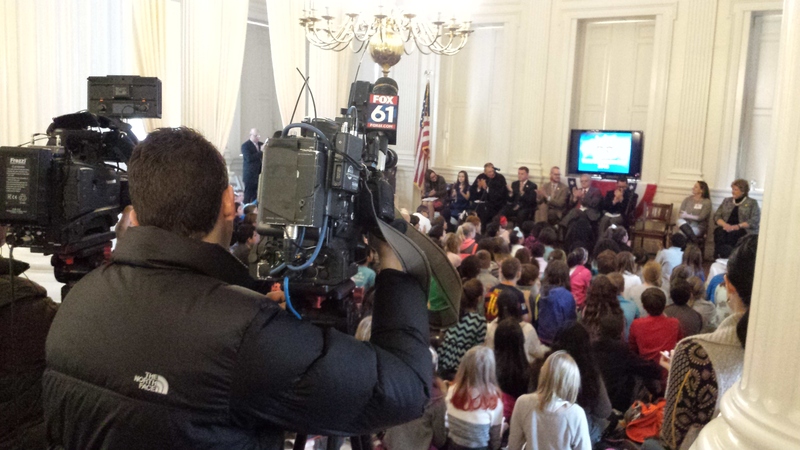 Connecticut’s First Kid Governor, Malloy Talk Kindness in East Hartford. Hartford Courant. March 18, 2016. Connecticut’s Kid Governor, Elena Tipton, Introduces Her Campaign for Kindness. Connecticut Commission on Children. March 11, 2016. Old State House Educator, Meriden Native, Spearheads Kid Governor Program. Record-Journal. February 21, 2016. Watch: Sights and Sounds from Yesterday’s Opening of the Legislative Session #ctpolitics. Hartford Courant. February 4, 2016. Proud New Fairfield resident is Grandmother to Connecticut’s First Kid Governor. New Fairfield’s Hamlethub. February 3, 2016. Mayor Marcia A. Leclerc Recognizes Elena Tipton, Connecticut’s First Kid Governor. Town of East Hartford. February 1, 2016. Larson Joins Inauguration of East Hartford’s Elena Tipton as Connecticut’s Kid Governor. The Daily Blog – Foreign Affairs Publisher. January 30, 2016. Larson Joins Inauguration of East Hartford’s Elena Tipton as Connecticut’s First Kid Governor. CT Senate Dems. January 29, 2016. Statement From the Secretary of the State on Connecticut’s First Kid Governor. CT News Wire. January 29, 2016. Meet Connecticut’s New ‘Kid’ Governor. WFSB 3. January 29, 2016. Senator Tim Larson Confers with @CTKidGovernor Elena Tipton Before her Inauguration. CT Senate Dems. January 29, 2016. New Kid Governor Takes Over State Capitol. FOX 61. January 29, 2016. Meet Connecticut’s First Kid Governor. News 8 WTNH. January 29, 2016. East Hartford Fifth-Grader Initiates ‘Campaign For Kindness’. Lite 100.5FM WRCH. January 28, 2016. East Hartford Fifth-Grader Initiates ‘Campaign For Kindness’. 96.5 TIC FM. January 28, 2016. EH Girl to Serve as Connecticut’s Kid Governor. Journal Inquirer. January 28, 2016. CT’s First Kid Governor Interview. WTNH 8 CTStyle. November 25, 2015.